Bath Downtown. Create your own route on the main streets of downtown Bath. 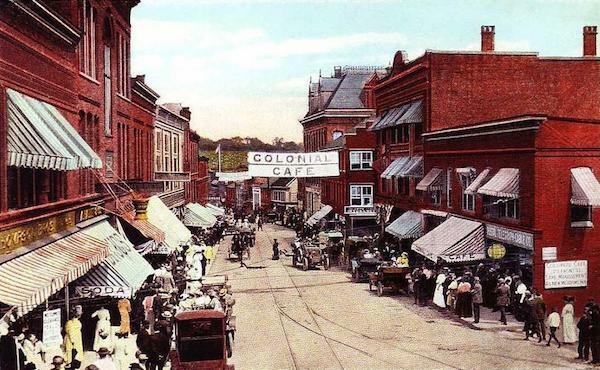 Historic buildings, homes, shops, and restaurants. You can easily do a few miles, and combine with waterfront run above. Good option in winter. Full Bath Loop & Whiskeag Trail. 7.4 miles. From downtown Bath, take the waterfront route above. Past Clapp Point, get onto Washington St. toward North Bath and then Upper High St, to the entrance of the Whiskeag Trail. Follow this wonderful gravel trail for 3.5 miles, through woodlands and along some coastal sections, back to downtown, connecting at North St. The trail is well-marked. Some uneven footing. MAP. 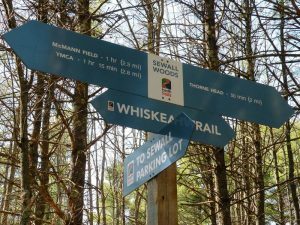 Whiskeag Trail Map. Short Route: at Bath Ironworks, Washington & Russell St.; Long Route: Center & Commercial St.